Time-reversal techniques for optimizing broadband communication networks, early diagnosis of Lou Gehrig’s disease, and rapid prototyping of microfluidics devices were the award-winning inventions recognized as the most promising new technologies at the University of Maryland Invention of the Year Awards. 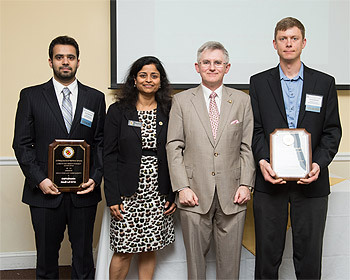 The University of Maryland’s Office of Technology Commercialization (OTC) hosted the 26th Annual Invention of the Year Awards on Tuesday, April 16, 2013 from 4:30-6:00 pm at the University of Maryland Golf Course Club House. Each year, the event is held to recognize the most promising innovations developed in the last year on the University of Maryland campus. The event is part of the University of Maryland's 30 Days of EnTERPreneurship, a month-long celebration and exhibition of innovation and entrepreneurship on the College Park campus. Winners were selected by an independent panel of judges consisting of representatives from on and off campus, who voted for the Invention of the Year in three different categories: Information, Life, and Physical Sciences. The BioHealth Innovation Inc., a Maryland-based innovation intermediary that helps commercialize market-relevant research, offered services to each winning team to help them write a successful Small Business Innovation Research (SBIR) proposal. UMD’s innovations help to stimulate the local economy, provide valuable products for public use, and help fuel research and entrepreneurial initiatives through inter and intra-university collaborations. The Invention of the Year Awards reception is hosted by the Office of Technology Commercialization, part of the Division of Research at the University of Maryland. Speakers at the reception included Vice President for Research Dr. Patrick O'Shea and OTC Executive Director Dr. Gayatri Varma. React Labs technology brings together the best of all these approaches, providing an innovative, integrated solution to the problem of gathering real-time reactions to events. At the core of the React Labs platform for real-time polling is a mobile app that lets users react to an event moment by moment and collects temporally fine-grained, interpretable data about their responses. The React Labs platform occupies a “sweet spot” between traditional polling and social media analysis: it allows researchers to collect crucial crosstab data and to carefully design questions for maximum value and interpretability while also creating significant engagement with users and collecting their temporally fine grained, unmediated real-time responses. Amyotrophic Lateral Sclerosis (ALS), also known as Lou Gehrig’s disease, is a disease of the nerve cells or neurons in the brain and spinal cord that control voluntary muscle movement. ALS is marked by the wasting away or death of neurons which can no longer send messages to muscles. This eventually leads to muscle weakening, twitching, and an inability to move arms, legs and the body. It is estimated that in about 10% of the cases, the origin of symptoms is genetic and in the remaining, it is unknown. ALS affects about 5 in every 100,000 worldwide. Most patients diagnosed with ALS die within 2-3 years after diagnosis and 25% survive for more than 5 years post-diagnosis. While there is no known cure for ALS, there is a drug called riluzole used to slow the progression of the disease and prolong the life of patients. Researchers at the University of Maryland have developed an innovative strategy to identify early, pre-symptomatic indicators and molecular markers associated with ALS. Early diagnosis and potential treatment would enable the alleviation of symptoms and hence prolong a patient’s life. A researcher at the University of Maryland has developed a unique and efficient method of transformation of lutein from both natural and artificial sources to highly pure beta-crytoxanthin. The uniqueness of this reaction is that it is a single-step, one-pot reaction that takes place at room temperature. The advantage of this method over previously used methods is that it eliminates unnecessary steps that require heating the reaction mixture and delivers a highly purified product. Obtaining a highly purified product is an imperative step in the process of manufacturing a nutritional supplement since it has to be safe for human and animal consumption. Researchers at the University of Maryland have developed nano scale VLP rods and tubes by engineering the Tobacco Mosaic Virus. The TMV derived VLP created is a rigid rod or tube consisting of multiple copies of identical capsid subunits (M.W. 17.5kDa) with a ~4nm diameter channel and a ~300nm axis. This high aspect (length to width) ratio enables the viral particle to be ideal for nano templating. In proof-of-concept studies, the investigators have demonstrated the metallization of surface assembled VLPs for making high surface area electrodes and the display of a receptor for the detection of a tag specific antibody. Researchers have also developed a technique to circumvent problems associated with the stability of functionalized virus particles that occur as a result of viral replication or recombination of the genetic material.